New Bible Study Starting Jan 14! Start our week on Monday mornings with a video lesson that will be less than 15 min in length. Keep each week’s assingment to less than 10 verses. Give you one lesson sheet each Monday that will take you, should you choose, a little deeper in your study. Encouraging you weekly to seek personal application from the scripture assignment. 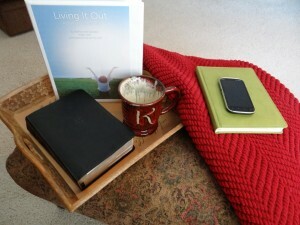 Optional – a comfy chair, cozy blanket, cup of coffee, journal … for those that this is the furthest from you reality…your cell phone because this is a available while you are on the go! The study has been formatted for your cell phone. Whatever your schedule looks like, this study is doable! So at a time conveinent for your scheudule, gather your things and join me as we learn how to live out the book of Colossians in our every day life! Please feel free to invite your friends and family to join us. To keep from missing out on any posts, be sure and sign up to receive email notifications. Look for my picture on the website that says “follow me via email” and enter your email address. If you have already submitted your email, it is not necessary to do again. The Bible Study sounds like just what I need with my work schedule. Can’t wait until Monday! Welcome Kathy! This study will work very well with a work schedule. Sounds like a fabulous time in the WORD and fellowship! Hi Kim! Welomce. I look forward to having you join us in this journey in the Word! Be sure to sign up with your email address in the space below my picture that says, “Follow Via Email”. This way each Bible lesson posting will be sent directly to your email. Let me know if you have any questions. Thank you for reaching out. Might have to spell this out for me. Does this study meet once a week. For ex I signed up for Monday around noon to receive my emails. I watched a video from ur website and it sounded like you meet everyday. Thank you. I am going to send you an email going over the format with you. I would like to try to study with you. Welcome Elaine. Please take a moment to sign up to receive the Bible study post to your email. You can do this by going looking on my website for my picture on the side bar that says “follow me via email” and put in your email address. Thanks! If you have any questions, please let me know. I look forward to encouraging you in your walk with Christ through His Wword. Kathy, I have a second e-mail address that might work for receiving your Bible studies. I can’t get it with the address you are sending it to. I’ve already e-mailed you asking you to try that second e-mail address (listed above). I can’t locate your second lesson on your web site. Looking forward to this Bible study. This is new for me to do one on line. My sister was promoted to Heaven at the age of 47. It’s been two years without her. I want to Live My Faith out Loud like Linda did. She was a Daughter of the most high King. Trusting God to use this study to continue to heal my grief. So glad to have you join Grace Full Journey! I love that want to live out your faith just like your sister did! Having lost a brother myself at an early age (he was 18), I can understand how you miss your sister! This is what I have found to be true…God is faithful…and as I deepen my relationship with Him through reading His Word, praying and being obedient to the Word in my life, He heals my wounds, grief, discouragments and provides joy that is just so sweet. I will be praying for you as you do this study. I would love to hear from you as you journey through the study. Your response brought tears to my eyes. God reminds me that I am not alone in my pain. I meet someone almost daily who had lost a loved one. My sister had two daughters I feel I’ve inherited. I told them we are apart of a club no one wants to be in. However, it helps to know we are not alone. Im really looking forward to this study.